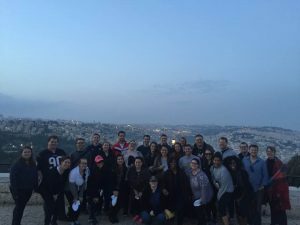 Israel Reflections 2017–Day One–or, Should a Bartender Be the Next Mediator for the Israeli-Palestinian Conflict? By: Andrea K. SchneiderPosted on April 26, 2017 April 26, 2017 Categories International Law & Diplomacy, Mediation, PublicLeave a comment» on Israel Reflections 2017–Day One–or, Should a Bartender Be the Next Mediator for the Israeli-Palestinian Conflict? 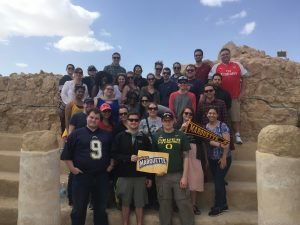 I am going to start posting the student reflections from the trip on a regular basis for the next couple weeks–hope you enjoy! 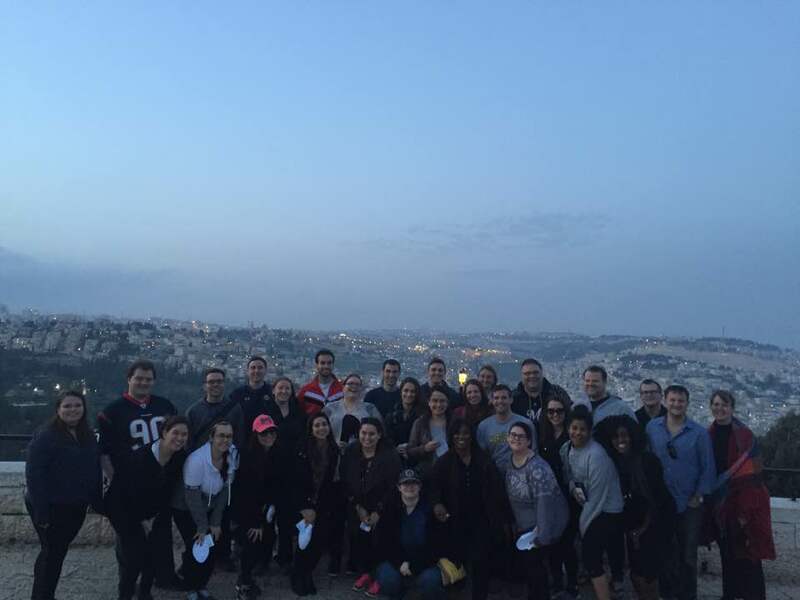 For the start of our Israel trip this year, we first stopped for an overlook of Jerusalem. Here our tour guide, Asaf, gave us a very brief history of Israel—6,000 years in 6 minutes…well maybe it took 10 minutes. Following a fabulous dinner at Focaccia-Bar (I highly recommend), several students explored night life in Jerusalem during Shabbat. Stephen Bollom shared his experience with identities changed to protect the innocent (sort of). Should a Bartender Be the Next Mediator for the Israeli-Palestinian Conflict? One of the most interactive and influential speakers during the trip was Moty Cristal, the CEO of Next Consulting. Having begun his career as one of Israel’s leading negotiators, Moty now conducts international negotiation trainings for the private sector. 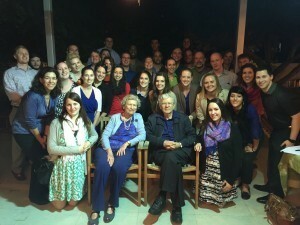 He made time to speak to us at the Rabin Center and his lesson was among the favorites of the trip. As our last speaker of the trip, I knew Moty would be a great wrap-up! Moty Cristal has become one of the leading negotiation experts in Israel and my class was fortunate enough to meet with him in Tel Aviv. He had the class participate in an exercise that involved three people dividing up a large sum of money amongst each other. Each role (A, B, and C) was given a different amount of bargaining power and rules for reaching an agreement. If all three individuals were able to come to an agreement, they could split up $121 million. However, if A and B reached an agreement, they would split $110 million; if A and C reached an agreement, they would split $84 million; and if B and C reached an agreement, they would split $50 million. 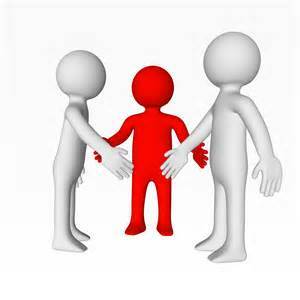 As a member of the A group, I realized that I was going into the exercise with virtually all of the negotiating power. I was also fairly confident that a deal would be reached and that I would be a member of the deal. Ultimately, I was able to agree with B to split the $110 million with $26 million going to B and $92 million going to myself. During the debrief, I noticed that A was a party to all of the agreements reached, except for one. Many of the groups talked about how difficult it was to take the power away from A. In relation to international conflict, Moty explained that A groups could, in almost every situation, include the excluded party without losing anything themselves. This viewpoint—that while the pie can be expanded, ultimately some sharing is required for an agreement to be reached—was one of the most important lessons I learned on the trip. During the exercise, I was a member of Nation C. Going into the negotiation with two much more powerful nations, I had little room to negotiate an agreement in which I was not the nation left out. Although my two opponents were inclusive and included me in an agreement, my fellow Nation C negotiators were not as fortunate; many of them reported back that they were left out of the final agreement. Moty’s lesson focused on how to negotiate while in a powerless situation. He told the group a story about the only time C was ever able to gain all of the money. In that situation, C was able to persuade his group members to agree to a coin flip. His lesson to the powerless negotiator was to negotiate as if there were no power. Instead of focusing on coalitions and the use of power, focus on the process of the agreement and working toward a solution that can benefit everyone. 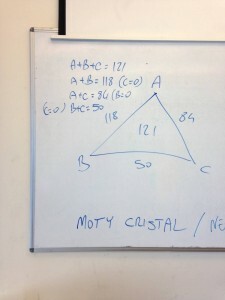 This was a wonderful exercise that left an impression on a good number of the students. Peace Be With You … And With You? By: Andrea K. SchneiderPosted on November 14, 2014 November 14, 2014 Categories Legal Practice, Mediation, Negotiation, PublicLeave a comment» on Peace Be With You … And With You? In a new competition hosted by Cornell University this past fall, students tested out their skills at dispute resolution over the internet. We finally received the results in December so my apologies for the delay in singing our praises. Students could choose to play the role of the plaintiff, defendant or mediator in a mediation that was completely conducted via email. Judges then graded their performance using the transcript of the mediation. I encouraged students to participate as part of the ADR class and was delighted with the results. While we all learned more than we wanted to about technical glitches, I hope the experience was educational as well. And, impressively, Marquette students dominated the competition. As mediators, we placed 1st (Jill Aufmuth) 4th (Jillian Dickson-Igl) and tied for 5th (TJ Wendel). As defendants, we placed 1st (Tea Norfolk), 3rd (Alexander Golubiewski), 4th (Heather Hough) and 5th (Marcus Hirsch). And, as plaintiffs, we tied for 1st (Ryan Session and Dillon Raunio), placed 2nd (Casey Shorts and Frederick Hostetler), 3rd (Kelsey Burazin and Kyle Silver), 4th (Paul Gunderson and Ryan Ybarra), and 5th (Adam Gilmore and Antwayne Robinson). Another way to measure how well we did is that out of the 17 teams that placed, 12 of those teams were from Marquette. A very impressive record! My congratulations to all the students that placed and appreciation to all those ADR students who participated. Well done. 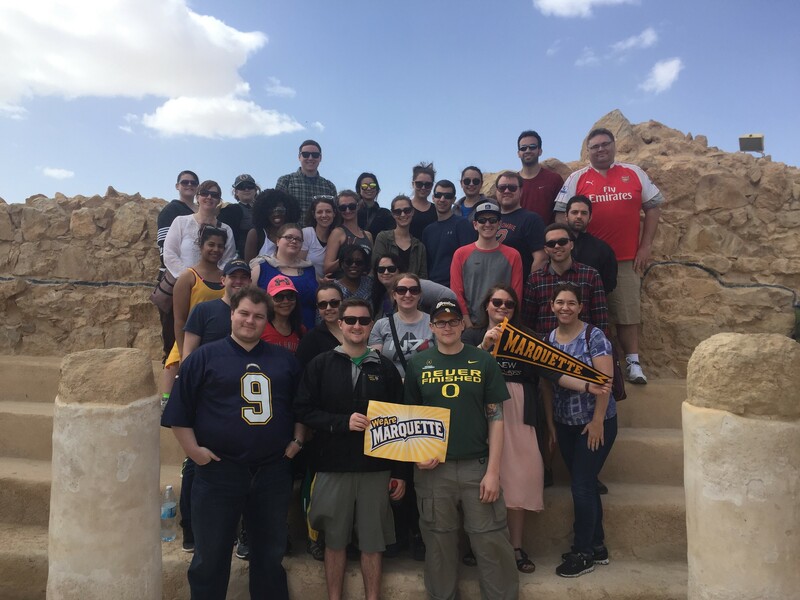 Sixteen dignitaries from Turkey, including members of the Turkish Parliament, representatives from the Ministry of Justice, and professors, spent March 1 at Marquette Law School (MULS) to learn about Wisconsin’s experiences with restorative justice and mediation. The law school’s Restorative Justice Initiative organized a meeting with them and Wisconsin Supreme Court Chief Justice Shirley Abrahamson, Wisconsin Supreme Court Justice Ann Walsh Bradley, retired Wisconsin Court of Appeals and Barron County Circuit Court Judge Edward Brunner, Milwaukee County Chief Judge Jeffrey Kremers, Milwaukee County Circuit Court Judge Mary Triggiano, United States Attorney for the Eastern District of Wisconsin James Santelle, and Milwaukee County District Attorney John Chisholm, along with other prosecutors and Wisconsin restorative justice professionals. Professor and restorative justice scholar Mark Umbreit, from the University of Minnesota Center on Restorative Justice and Peacemaking, as well as MULS Professors Andrea Schneider and Michael O’Hear, also attended the meeting. The Turkish delegation is working with the United Nations’ Development Program on judicial reforms and traveled to the United States for a week-long visit to learn about the use of mediation and restorative justice in our American court system. 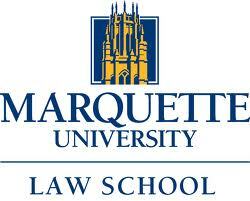 The group had meetings in Washington D.C. and New York and then came to Marquette University for one day. The Turkish Parliament has already incorporated Victim-Offender Dialogues into the Turkish criminal code and is working on drafting mediation legislation and part of the civil justice system. I will be traveling to Istanbul later this week to be part of a workshop on restorative justice for judges and prosecutors in Turkey.